Posted on July 28, 2016 at 10:00 am. A new report conducted by The Australian Gambling Research Centre (AGRC) has revealed the areas of Victoria suffering the most from problem gambling, with poorer areas being the worst hit. The results were achieved by studying losses on pokie machines, with the figures hoping to be used to prevent gambling related harm. The ongoing study aims to look at gambling in suburban Australia to investigate the environmental factors that contribute to “different levels of gambling consumption, harm and resilience.” The AGRC is interested in determining why gambling problems are prevalent in some places and not others. The report revealed that Sunshine, Sunshine West and Sunshine North have the worst pokies losses, averaging at around $1,358 in pokies losses per adult. Albion and Braybrook were not far behind, while areas like Box Hill which have fewer pokie machines reported only $400 in losses per person. The research suggests that families in the western suburbs have a higher socioeconomic disadvantage compared to those in the eastern suburbs, which has a great contribution to harmful gambling practices. 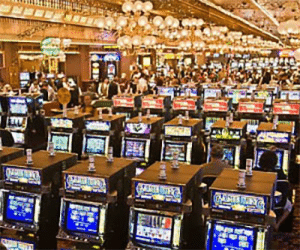 More reports like this one are expected to be conducted as the battle regarding online gambling continues to gain media attention, along with Nick Xenophon and Andrew Wilke’s call to reinstate the pokies reform. Once again, pokies are hot topic. According to the Victorian Commission for Gambling and Liquor Regulation, Victorians spend $6 billion on gambling in 2015, with $2 billion on the pokies in the Crown Casino alone, plus $2.6 billion in pokies losses in pubs and clubs around the state.